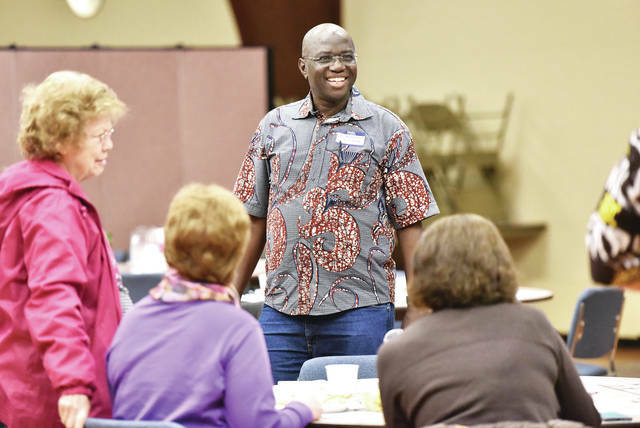 Guest speaker Reverend Ruffino Ezama, of Cincinnati, attends a “Taste and See Uganda” at St. Michael Hall in Fort Loramie, Thursday, March 21. 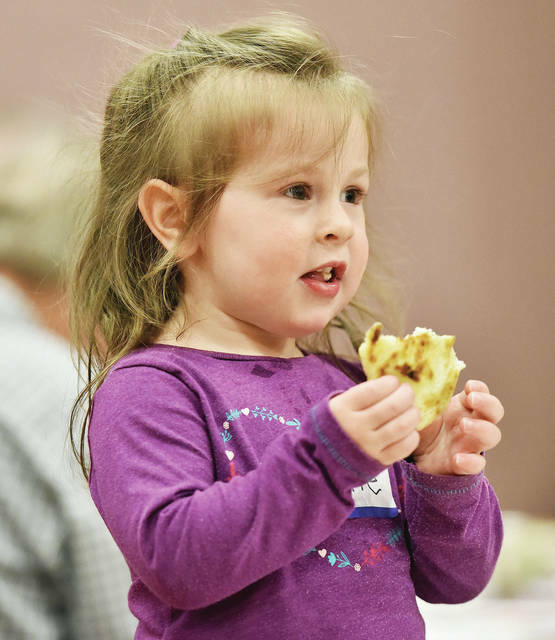 Zelie Bornhorst, 2, of Fort Loramie, daughter of Josh and Mary Bornhorst, eats a piece of flat bread called chapati, which is made in Uganda. Zelie was attending a “Taste and See Uganda” at St. Michael Hall in Fort Loramie Thursday, March 21. FORT LORAMIE — Around 50 people were in attendance at the “Taste and See Uganda” event on Thursday evening at St. Michael Hall, in Fort Loramie. This is the fifth annual “Taste and See” event, which focuses on a different country each year. Sponsored by Outreach Commission, whose mission statement is, “to cultivate opportunities for all people to answer God’s call through works of mercy, charity, justice, and solidarity as inspired by Catholic social teaching to live the Gospel,” the event included traditional Ugandan cuisine, as well as a speaker native to Uganda. The Outreach Commission operates within the structure set by the parishes of St. Michael and Ss. Peter and Paul Pastoral Councils. It includes ministries of pastoral care, social services, evangelization, and peace and justice. Its scope includes outreach to parish membership, as well as the local and global community. Ann Bollheimer, pastoral associate of St. Michael Church and staff liaison of the Outreach Commission, said Thursday’s event was done in conjunction with Catholic Relief Services Rice Bowl program. CRS Rice Bowl is the Lenten program of Catholic Relief Services, which is the official relief and development agency of the United States Conference of Catholic Bishops. Through CRS Rice Bowl, faith communities in every diocese throughout the U.S. put their faith into action through prayer, fasting and almsgiving. Lenten alms donated through CRS Rice Bowl support the work of CRS in roughly 45 different countries each year. Twenty-five percent of all donations to CRS Rice Bowl stay in the local diocese, supporting hunger and poverty alleviation efforts. Thursday’s Uganda-inspired meal included a cabbage, pineapple, and peanut salad with a buttermilk and greek yogurt vinaigrette; beans sautéed with onion, garlic, peppers, and spices, served over steamed white rice; an East African-style flat bread, called ‘chapati,’ with red and green pepper curry; and a fruit salad with mango, pineapple, and banana. The evening’s speaker, Fr. Ruffino Ezama is a Ugandan Comboni missionary priest. Ezama became an ordained priest in 1994. He served in the Archdiocese of Cotonou in the Republic of Benin, a small country in West Africa, from 1996 until 2001 when he began working in Lodonga Basilica Parish as assistant pastor in the Arua Diocese, Uganda. Ezama served as the vocation director of the Comboni Missionaries in Uganda, from 2004 until 2008, and is presently a member of the North American province, serving as mission director, as well as offering mission education programs from the Provincial Headquarters in Cincinnati. Uganda is known as the “Pearl of Africa,” which is a phrase that was popularized by Winston Churchill, Ezama said. Ezama spoke about the beauty of the Ugandan scenery. Ezama also spoke about the serious issues that challenge Uganda, including protracted wars, HIV/AIDS pandemic, trans-generational poverty, the “semblance of democracy,” corruption, unemployment, the vulnerability of children, and a large workload on the country’s women. As for religion, Ezama said, Uganda is made up of 85 percent Christians, with the Roman Catholic denomination making up 39.3 percent of this, and fourteen percent of the population is Muslim. Ezama went on to reiterate the importance of creating and protecting churches within Uganda for the development and education that they so often provide. To learn more about the CRS Rice Bowl program, or to donate to the cause, visit crsricebowl.org.